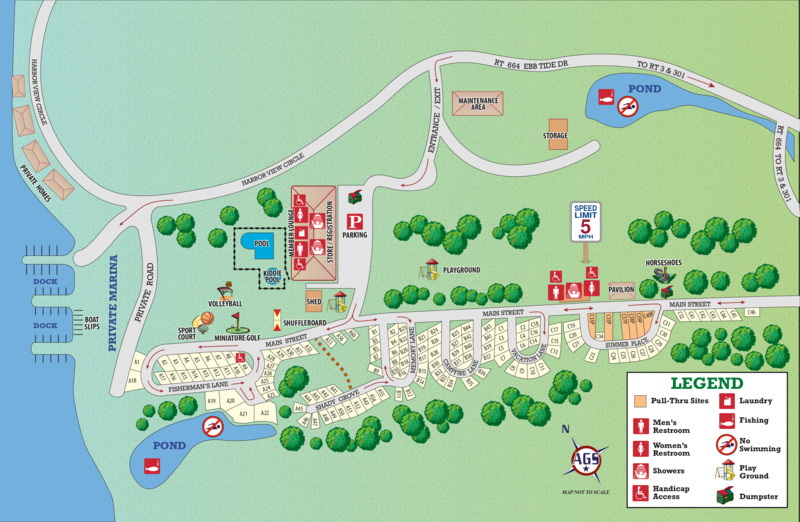 Ask fellow campers about "Outdoor World - Harbor View Campground" and nearby attractions. First time here. As we were driving in the rain was coming down, the nice ladies meet me in the parking lot with our check in paperwork in hand! The service was great, Park is clean, and the lots have plenty of room. No WiFi or cable but the cell service is good. We’ll come back again. We camped at Outdoor World - Harbor View Campground in a Travel Trailer. This is a clean, nice, wooded campground with a small laundry room with only 2 working washers, no wifi or cable and too wooded to expect to use satellite. Nice wide spaces with patio, picnic table and fire pit. 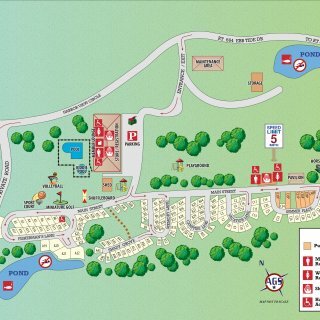 This campground is close to many historical sites. We camped at Outdoor World - Harbor View Campground in a Motorhome. Not a great place for big rigs. Sites are tight and closely treed which makes awnings and slide outs a bit of problem. Park staff monitors the campground like hawks -- driving through dozens of times each day looking for things that shouldn't be happening. This is a mixed blessing; it keeps people in line to be sure, but you can get the feeling that you are under suspicion. Also, one of the only places I have ever stayed that requires the entire payment in advance, even if you book several months ahead. We camped at Outdoor World - Harbor View Campground in a Motorhome. They do not have any accommodations for handicapped people. Although there was ample places by the bath house, they parked us at the other end of the park. We were placed in a small mud-pit on top of other campers. So tight that we cannot open our awnings and my RV sticks out into the main road. This place and the people who are here to help, are useless. People are not helpful. We will never come here again! If you are handicapped, DO NOT COME HERE! We camped at Outdoor World - Harbor View Campground in a Travel Trailer. This was a very nice park with a beautiful pool (excellent for swimming laps)! The sites we easy to navigate and get into overall. The after-hours park host greeted us shortly after we arrived and was very welcoming and helpful. We will likely stay here again if we are in the area. We camped at Outdoor World - Harbor View Campground in a Motorhome. Colonial Beach on the Potomac is just 20 minutes away and a great place to spend some time. It is a quiet little town on the water, not real "touristy" like Virginia Beach or some of the other nearby attractions. We were able to find a mechanic nearby to help out with an issue with our RV brakes. Walmart and several auto parts stores were within an hour of the RV park. Bus Tours to Washington, D.C. from a nearby town (about 30 minutes away) were recommended, but we simply ran out of time. This campground is part of the Thousand Trails Membership. I am not a member but was able to make a reservation since they had openings. It is a very shaded campground, but that also make a lot of the sites very tight. I could not open my bunkroom slide due to the way the site was set up. I was in sections C, which is where many of the long term members stay. It had the largest spots, where most sites in the A section were very small. I checked in after hours and the map they left for me indicated in highlighter that I should go in the road the opposite way from what was indicated on the printed map. This did not work at all and I ended up having to back out of the road. My friend stayed that they took her the "wrong" way leading her to the spot. I am not sure the people giving these directions understand how to put a camper in a spot easily. All the sites have a small concrete patio. However, looking at a lot of sites, I believe these are left over from the days when Pop-ups were the most common and it is where they were parked. This could be a really nice park if they spent a little time and money on the sites. Many GPS's will tell you to turn down Evergreen Drive, which is a dirt road just before the campground. DO NOT DO THIS!!!! Keep going straight and turn on EBB TIDE DRIVE. EBB TIDE is the road that the campground is on and Evergreen cuts back to EBB Tide, saving you about 500 Yards travel distance. However, you will not make it with a RV. I went back to check it out and see what would have happened if I had gone down Everegreen Drive. I had to put my truck in 4X4 to get through and the ruts were very deep. No way you would pull a camper through this route. If you have a large RV try to get section C or B. It was a very clean park and all the people around me were very friendly. We camped at Outdoor World - Harbor View Campground in a Travel Trailer. George Washington's Birthplace is 3 miles away and Free! There is also a Berry farm close by where you can pick yuour own or just buyt what is in season. Great Berry pie also. Unlike most Thousand Trails parks they assign sites here, which was a good thing. That way they fit the unit for the site, plus being a holiday weekend and booked full, that worked best for both them and us. Heavy rain arrived just before we did and the ground did not want to soak up the water so a lot of puddles and mud. Overall the place is nice and very well run, friendly and helpful staff and everything worked well. Will return. We camped at Outdoor World - Harbor View Campground in a Fifth Wheel. We stayed in a pull through site in a 43ft fifth wheel. The site was clean, quiet, and we'll kept. Staff was very helpful and friendly. We camped at Outdoor World - Harbor View Campground in a Fifth Wheel. Campground is about an hour from Washington DC, when traffic is good 2 to3 hours when busy. Near trees, so satellite did not work, but was able to pick up analog television. No bbq pit, had to ask for a picnic table. Upon arrival our electric did not work, but it was fixed in less than 30 minutes, in sweltering heat! The office closes early, but this is a quiet park. I would gladly come back. We camped at Outdoor World - Harbor View Campground in a Travel Trailer. George Washington's birth place, Colonial Beach town, And make a drive to Billy's Crabhouse, on Popes Creek road, Newberg MD. The seafood is great. Get the Waterman's special (enough for 3 people @ $48.00). Rate is for Zone Pass holders. Nice and quiet, except for occasional ordinance testing about 15 miles away. Managed to get good DirecTV shot at site B26. Not easy here - many, many trees. Didn't use Off quickly enough and got mosquito bitten every day. We'll go back, but probably not when it's hot and damp because of the bug bites. Don't believe your GPS when you come. One of ours tried to send us down a dirt road, and the other took us down a permanently closed road over a dam whose road had washed away. We camped at Outdoor World - Harbor View Campground in a Motorhome. We had been camping at Harbor View three weekends ago, we decided go come back made reservation for Aug 16 weekend requesting a pull-thru. 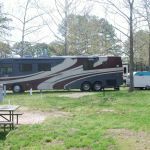 We pulled in to the campground that morning and they told me they have a new policy that only 38 foot RV can use the pull through sites and I told them that my RV is a Fifth wheel 35 foot with slide outs on both sides and a satellite dish that I can only use in the pull through sites. We have stayed in the pull-through on past visits, and four of them were unoccupied when we arrived. They tried placing me in a back in site that would be to small. I was told that their policy is first come first served we will never book or join with encore again ! We camped at Outdoor World - Harbor View Campground in a Fifth Wheel. Enjoyed our stay again this time, but they continue to have water problems. The site we originally wanted didn't have water, and its neighbor had a hose strung to an adjacent site because it was dry too. They repaired one section of the park with new water and power, but they charge $5 per night extra to stay in that section. That section is not upgraded, just fixed. Not a big deal to go from $0 TT member price to $5, it's just aggravating. It also causes the other two sections to be crowded while the "premium" section is sparsely used. We'll be back, but not as happily as before. We camped at Outdoor World - Harbor View Campground in a Travel Trailer. This is an unbelievably friendly park. About half of the park are seasonal professionals from the DC area who use it as their getaway location. The manager is new and could not be more helpful or concerned about the welfare of her park. The restrooms/shower houses are older but spotless!! The park is remote, yet near local historical sites and a great state park. Pool was not yet open when we visited. Would definitely stay here again if in the area. We camped at Outdoor World - Harbor View Campground in a Fifth Wheel. I love this campground - we visited over July 4 last year and were back again this year for Labor Day. It, by FAR, has the most friendly folks we've ever interacted with! We had no issues maneuvering our 42' FW around the campground. We called ahead as we were delayed by a hospital appointment and they helped "hold" a big rig accessible pull through site for us. (TT/OW doesn't really "hold" sites, but since they help everyone pick their site, they seemingly helped keep this one open for us.) The bad was that it was immediately adjacent to the pavilion and on Saturday they had a Crab Feast which then turned into a corn hole tournament which then turned into a louder version with much drinking and music. Fortunately, it was quiet and everyone returned to their campers by 9:45pm or so. A little later than we would have liked, but being a holiday weekend - we knew what we were getting into. The pool is big and nice. The baby pool is small and warm. The mini golf is "quaint" (aka, super small/9 holes). We'll gladly return again. We camped at Outdoor World - Harbor View Campground in a Fifth Wheel. This campground is about 1 hour east of Fredericksburg in a rural section of Westmoreland County. It is located close to George Washington and James Monroe's birthplaces as well as Colonial Beach. The property sits between some cornfields and waterfront developments on the Potomac inlets. Layout is a linear arrangement of loops and most sites are pretty well shaded. Pool is nice, and all facilities seemed to be well maintained. The brochures mention Wi-Fi , but we couldn't seem to locate it. However, cell phone/3G signal is fairly usable. Very quiet campground, no discernible road noise or from other campers. Seems to be one of the more peaceful of the 1000 trails system. We enjoyed it. We camped at Outdoor World - Harbor View Campground in a Travel Trailer. Are you affiliated with Outdoor World - Harbor View Campground ?